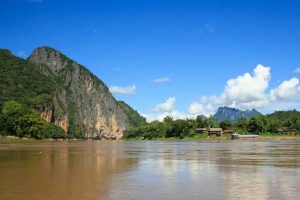 The rainy season isn’t lauded as the best time to visit Laos. The roads are muddy and it rains daily. The river swells and the clouds hang heavy over the dense green jungle. Not that this should stop you from visiting; there’s always a way to enjoy a visit to Laos! And, when the rains set in, the best way to appreciate it is on a boat. 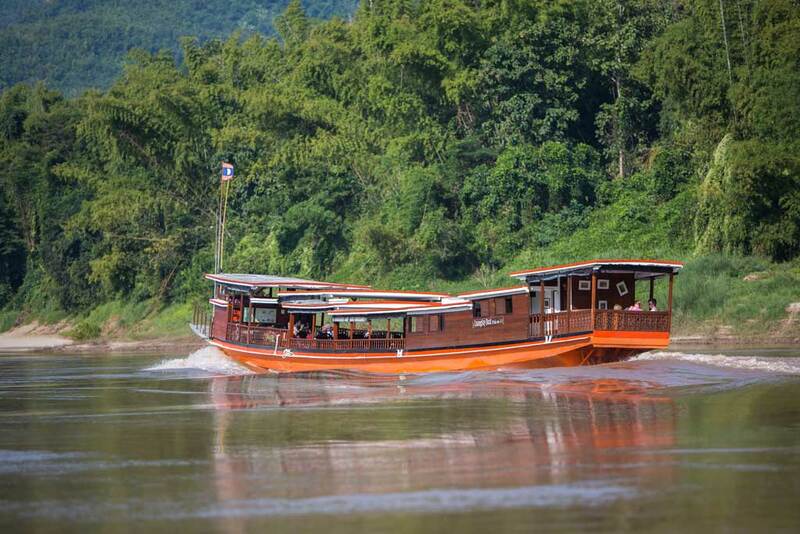 There are few Mekong River cruises in Laos that travel for more than a few hours. 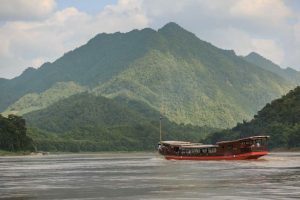 Hydropower dams have forever altered the flow of this majestic waterway, with more underway, including the Pak Beng dam north of Luang Prabang. 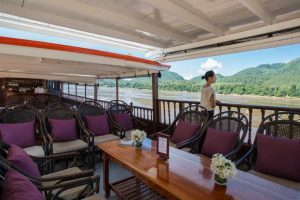 So, it is a rare treat to hop aboard an intimate two-day cruise by French-Lao luxury riverboat company, Luang Say. Our journey begins in the crisp morning air at the Lao border town of Huay Xay. 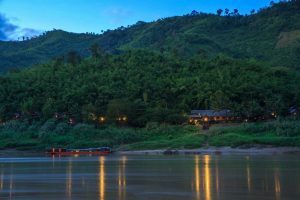 Having arrived from Luang Namtha the previous day, we are picked up after breakfast at our hotel by Luang Say’s cheerful drivers and transfer us to our waiting boat. We make ourselves at home on comfortable, padded chairs. The custom-built boat is spacious and easily seats 30 people, but there’s only 14 of us today, and we’re waiting on a few people coming through the nearby Thai border crossing. It has rained the previous night, and wisps of thick white fog linger on the surrounding mountains. Finally, the others board and our boat putters away from Hua Xay. As the fourth Lao-Thai Friendship Bridge falls behind us, so too do the signs of life and activity. Soon, it’s just us, the boat and a green, lush mosaic of jungle landscape. Other passengers curl up with books or watch the world float by from cosy front and back vantage decks. Friendly deckhands stop by to take coffee orders, handing round bowls of vegetable chips and bottles of water. Our two young kids get the VIP treatment and a supply of on-demand cookies. It’s called the slow boat for good reason, but it’s less about the pace, and more that time seems to take on a different meaning. I look up from my page and realise that the thick green jungle has slipped quietly into farm land. Long, neat rows of rubber trees follow dense banana plantations, and there’s an occasional small farm with a foraging pig or herd of goats. A lone fishermen on his wooden longboat throws out a fishing net with a gentle splash. As lunchtime approaches, a delicious aroma wafts down the length of the boat from a tiny kitchen at the back. Size is no barrier, as from it emerges a delicious spread of Lao food – beef stew, fried rice, vegetables and the popular Luang Prabang sausage, plus fresh fruit, (including bananas, of course), for dessert. It’s falang style Lao food (aka minus the chilli and padaek, Laos’ potent fish sauce) and there’s plenty of it. 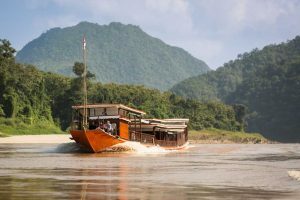 Boat travel with all its fresh air and beautiful scenery makes everyone hungry.